So you recently found out that you’re pregnant – congratulations! 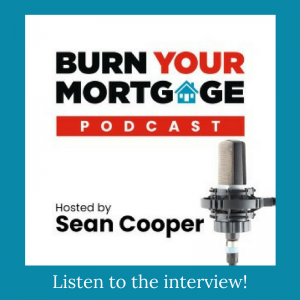 This is such an exciting time, with so many changes underway. And if it’s your first pregnancy, you might be a bit overwhelmed by it all… and maybe not feeling your best. I definitely found myself in that camp. This is my first pregnancy and I didn’t really know what to expect. Since I’m now in my second trimester, I thought I’d share the very best products I found for getting through the first few months. Here are 8 pregnancy essentials I’d recommend for this stage. I plan on posting my essentials for each trimester, so stay tuned for that! While these products aren’t in any particular order, I would say that this was probably my #1 essential during the first trimester. Even if you don’t start showing until the second trimester, there’s a lot of bloating that can start much earlier. Having comfortable clothes (especially pants!) can make all the difference in how you feel. 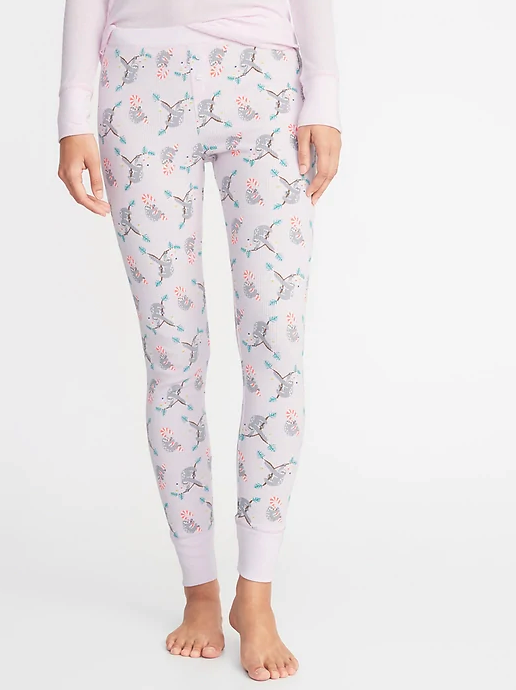 Some recommendations are sweatpants with drawstring waistbands, stretchy pyjama pants and leggings, and onesies or nightgowns that don’t come in at the waist. For tops, I loved baggy sweaters and loose flannels. But my absolute favourites were my thermal pyjama sets from Old Navy which are super comfortable and stretchy. You can shop their sleepwear here. Being physically comfortable will make everything much more manageable! As I wrote about in my post How to Ease Morning Sickness: 7 Simple Ways, you don’t have to suffer with nausea in silence! Ginger Gravol, ginger supplements (like these lollipops! ), and other anti-nausea products are great to have on hand for when sickness strikes. Thankfully, I didn’t experience any vomiting – just nausea, and it was manageable. 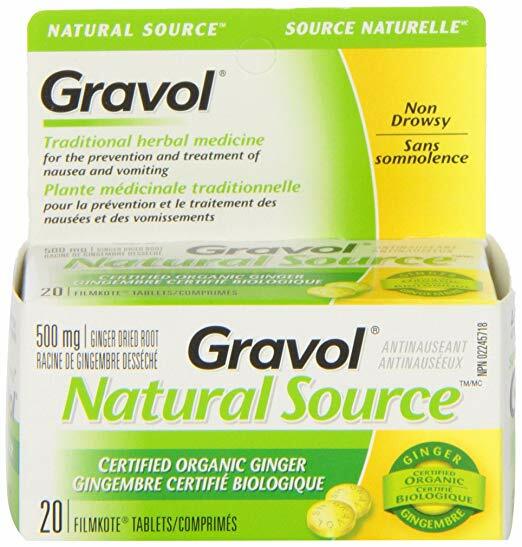 Between ginger Gravol and ginger ale, I was able to ease my symptoms quite quickly. The symptoms didn’t really start until I was able 6 or 7 weeks along, so if you’re earlier than that, you may want to pick up some anti-nausea products to have on hand in case it happens. Check out my morning sickness post for a complete list of recommendations on handling nausea. There are a ton of different pregnancy apps out there, but I’ve been really impressed with the Glow Nurture app (which is free!). It’s easy to use and gives me daily and weekly updates on baby’s development. I really like how it lets me see how many weeks along I’ll be at any given day – I can jump ahead to any week and find out. Glow Nurture also has a Community section where you can join different groups, like message boards. I’m part of the April 2019 Babies group which is amazing, because I can talk to other moms-to-be who are due around the same time as me. There are also groups for women in each trimester, product recommendations, first time moms, and more. It’s been a huge asset to have a sense of community, especially before we announced our pregnancy to friends and family. Pregnancy can make you thirsty, and even if it doesn’t, you should be staying hydrated as much as possible. 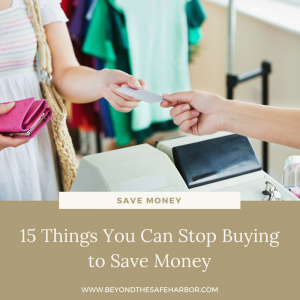 You can certainly use a glass or cup around the house, but I often used a large water bottle to encourage myself to drink more water, and also to be more portable when I was running errands or out of the house. You’ll also benefit from a large water bottle when it comes to ultrasound preparation! You’ll likely be asked to arrive at your appointment with a full bladder which means drinking 1 litre (or 0.26 gallons) of water and being done one hour before your appointment. So if your appointment is at 2pm, you need to have finished drinking your water by 1pm and may want to start at around noon or earlier. 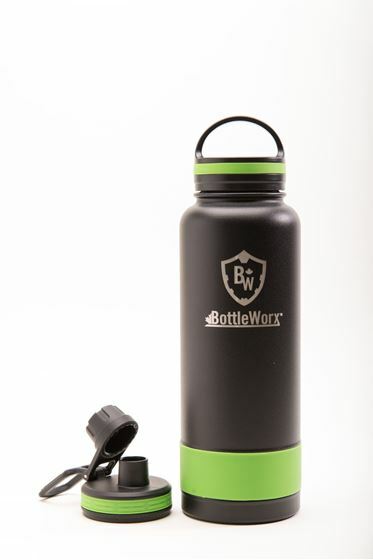 I like the Bottleworx bottles, but anything works! You may get dry skin and dry lips during pregnancy. For me, this started pretty early on in the first trimester. 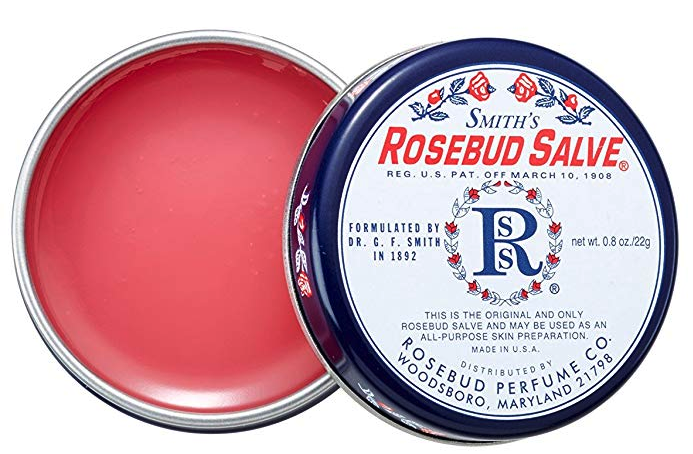 To combat it, I used Smith’s Rosebud Salve Lip Balm (here’s the 3-pack) every night before bed, and it helped keep them moisturized. I also kept an eos Lip Balm in my purse which I applied throughout the day if I needed it. If you haven’t started taking folic acid or prenatal vitamins, it’s time to start! I started with 1mg of folic acid daily about 6 weeks before getting pregnant, and then changed to prenatal vitamins once I was about 7 weeks along. Definitely speak to your doctor about what they recommend. My doctor said that most prenatals were the same, but I looked for one with at least 1mg of folic acid since I knew this would be important during the first trimester to prevent neural tube defects. 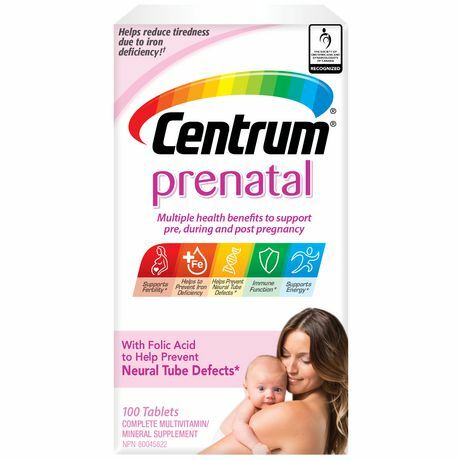 I take the Centrum Prenatal Vitamins and recommend them – they haven’t given me any nausea or any negative side effects, no matter what time of day I take them. I take them with food (as directed), which may help with their absorption. They’re a caplet so there isn’t the flavour or texture factor that I’ve heard can be off-putting with other formats like gummies. As your body expands, your bras may start to feel small, even on the loosest clasp. 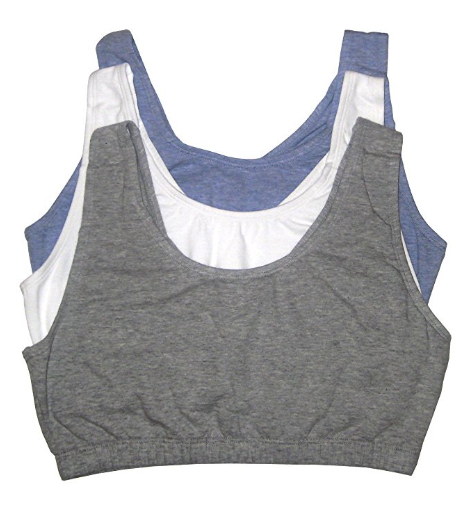 I found I was most comfortable in cotton or stretchy sports bras, which you can find at most major retailers. These simple cotton ones from Fruit of the Loom (pictured above) get great reviews on Amazon. If you have a lot of fatigue and nausea, you may find yourself needing to veg out and wait out the wave of sickness. 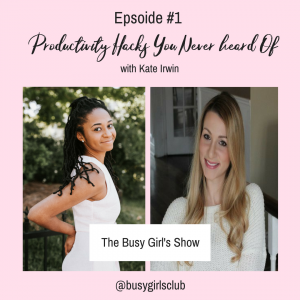 I found Netflix shows to be a great distraction. I rewatched The Office which was perfect since the episodes are short and light. It helped me pass the time until I felt better and was able to get up and do something. My post The Absolute Best TV Shows on Netflix (You Need to Watch!) has some great suggestions too. Those were my top pregnancy essentials during my first trimester! What products could you not live without? I’d love to know – chime in in the Comments section below. 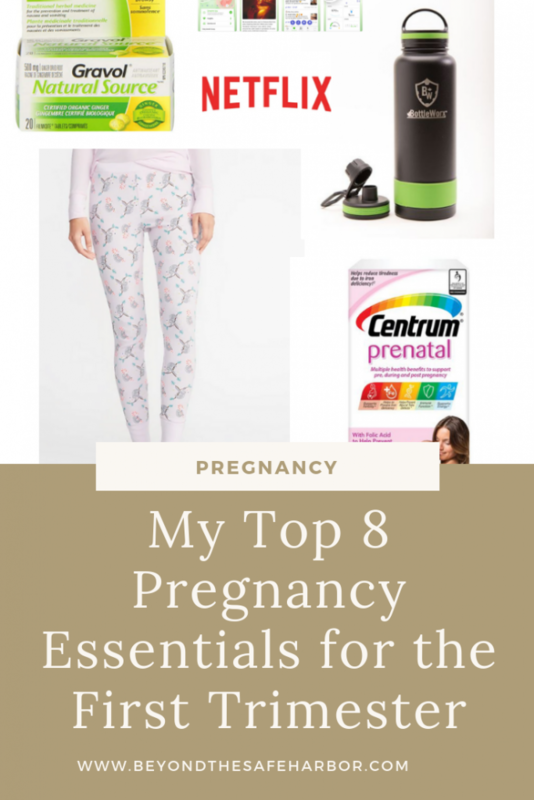 And check out my post My Top 8 Pregnancy Essentials for the Second Trimester for more picks as your pregnancy progresses.